Resveratrol – An antioxidant-rich plant polyphenol that promotes a healthy inflammatory response and increased energy production through efficient mitochondrial function. It helps support cardiovascular health and to promote healthy metabolic function. Biotin - One of the B-complex vitamins involved in cell growth and division. Essential to the health of connective tissues and indicated to promote and maintain the growth of healthy hooves and coat. Acts as a co-enzyme in several crucial but complex chemical reactions related to metabolism including the synthesis of glycerol for body fats, RNA, and DNA. Atlantic Kelp – Rich in vitamins, trace minerals and amino acids essential to support healthy daily bodily functions. Sea kelp promotes digestive health is also a natural source of iodine beneficial for thyroid and glandular health. Flaxseed Oil – An excellent source of Omega-3 fatty acids to promote neuromuscular development, skin health and coat quality. Lecithin – A sustainer to the nervous system and brain promoting alertness and steady nerves. Lecithin helps promote healthy liver function and metabolic process. Pepperment Oil – Promotes digestive health and serves as a flavoring agent due to its suitability to the equine palate. Peppermint oil contains numerous minerals and nutrients including manganese, iron, magnesium, calcium, folate, potassium, copper, Omega-3 fatty acids, vitamin A and vitamin C.
Ingredient Source: All the ingredients in Resvantage Equine® are naturally occurring. Resveratrol is found in more than 70 different plant varieties including grapes, peanuts, pomegranates, blueberries, pines and Giant Knotweed. Resvantage® sources its trans-resveratrol from the Knotweed plant; Botanical name - Polygonum Cuspidatum. This is the same source of pharmaceutical grade resveratrol used in studies conducted by the NIH (National Institute of Health) and other medical research institutions and universities. Capsule Integrity: Resvantage Equine® is manufactured to cGMP* standards and a rigorous quality assurance program. It is lab tested during all phases of the process insuring that the active compounds are free of heavy metal toxicity and microbiological contaminants. RESVANTAGE EQUINE® is encapsulated in an oxygen-free, nitrogen-rich environment by the Capsugel® division of Pfizer utilizing their exclusive patented Licaps® process. This helps prevent oxidation and ensures that each Resvantage Equine® capsule retains its potency. 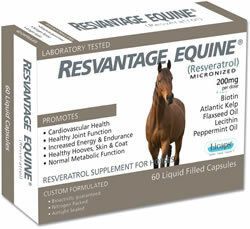 Administration: Resvantage Equine® capsules are chewable capsules intended to be taken orally. They can be fed to the horse by hand or combined with feed. The supplement is lightly sweetened and flavored with peppermint oil to ease administration. If your horse rejects the supplement, try giving in a hand full of sweet grain or pocket it inside a Fig Newton, marshmallow, pitted date, prune or piece of banana until they become accustomed to it. Suggested Use: Give horses 2 capsules daily; one at each feeding divided between AM and PM. For optimal absorption, administer before or during the feeding. Safety/Resveratrol: Resveratrol is well tolerated. There are no known side effects or contra-indications associated with resveratrol supplementation. Precautions: Response to supplements varies by individual. If your horse exhibits any symptoms that concern you, discontinue use and contact your veterinarian.